A slow down on our posts recently due to various on-going projects, the results of which we will be posting shortly. 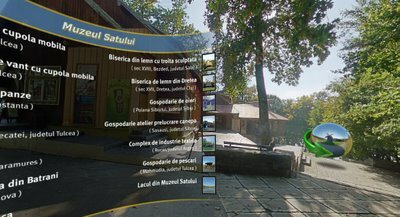 While pondering the future of virtual tours we got a email from Ovidiu Sopa who lives in Sibiu, Romania, detailing his first set of panoramas. Inspired by some of the work on Digital Urban (its nice to know we have some readers!) he has used High Dynamic Range for each of his images and more interestingly rendered 3D spheres superimposed on each scene to provide links between each node. The result is a stunning tour and well worth a look, you can check out his site from here. If anyone one else has created a tour that stands out from the rest, let us know via the email link in the side bar. Wow, the menu within the virtual tours is very cool. I also like the hot spot incons in the rotation. Very neat. This is such a cool menu – it must have taken ages to make! Well done!